Disclosure: Our vape reviews are based upon the experience, testing and skill of our trained paid staff. Links from QuitSmokingCommunity.org to one of the reviewed products or brands, will allow you to purchase directly from the provider. We receive commissions from these providers; this does not affect your price and helps to pay for the operations of this informational website. To learn more click here. Thank you! The iolite Wispr is the only still-relevant butane powered vaporizer. It does a really good job of vaporizing with butane and the vapor quality is definitely up there! We know not everybody has time to read our full reviews. So here is a quick category by category breakdown of the ioLite WISPR followed by a quick synopsis. My Freedom Smokes is one of the best online e-cigarette stores. They have great starter kits for beginners as well as advanced batteries and tanks for veterans. IoLite previously made the very first portable vaporizer. Now they’ve created the WISPR to move their brand forward and bring something new to the portable vaporizer field. Does it manage to innovate or just feel unnecessary? We’ll let you know in our review below. The WISPR’s boxy design recalls the walkie talkies often used in the past decades. It’s not the sleek and rounded design that we are familiar with seeing in most vaporizers. So while it is different, we appreciate the people at ioLite trying to forge their own path. It’s still small enough to fit in your pocket comfortably, and even more so when you compare it against the previous ioLite vaporizers. The last one had a mouthpiece that wouldn’t fold in or retract. That made it bulky and awkward to put in your pocket. But the WISPR has a retractable mouthpiece that snaps in. There is no worry that it will come open in your pocket, and the whole unit is easy to carry around. The WISPR did initially come with a see-through butane tank, so you could tell how much fuel was left, but that is no longer the case. If you were expecting that feature, you might be a little disappointed. Now the WISPR works a bit different from your conventional portable vaporizers. Most of those are electronic and use heating elements. The WISPR runs on butane, which means it doesn’t really have any electronic components. You will need to fill the butane up every now and then, but you don’t have to worry about it combusting like a traditional cigarette. The only thing reaching the herb is the heat from the butane, not any fire. So you’re still getting all the benefits of vaporization. To turn it on, you simply depress the power button. This pushes some butane into the heating chamber. Then you press the power button again and the device will heat up. It takes less than a minute to reach its full 190-degree temperature. This is the preset heat, and you cannot change it. 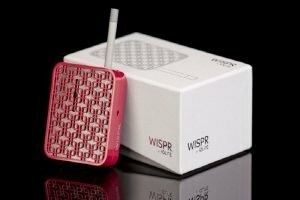 The WISPR creates a surprising amount of vapor for such a small device. We aren’t used to seeing this much vapor production out of anything short of a desktop vaporizer, so that is a nice bonus. And while the previous ioLite vaporizer had some trouble with the mouthpiece getting too hot, that’s not an issue here. We did have some problems with the vapor becoming too hot, but that only seems to happen with long, deep breaths. We found that taking smaller breaths solves the problem for the most part. The mouthpiece is made from silicone, so it never gets very hot. It’s simply a nice, comfortable mouthpiece that is perfect for this device. The WISPR is never too hot either. It gets slightly warm, but not uncomfortably so. It is simply a well-designed piece of technology that works very well despite its unconventional power source. And like its name implies, the WISPR is very quiet. It’s not that most portable vaporizers are loud, but the WISPR goes the extra mile and ensures that the unit is very discreet and makes very little noise. We like what ioLite has done with this unit. It’s not like a lot of what is out there, so it won’t appeal to everyone. But we love it for what it is, and it keeps things simple, which is a real plus for a unit that makes a great introductory vaporizer. Overall, we’re impressed with what ioLite has done with this vaporizer. They managed to take an unconventional power source and turn it into one of the better portable vaporizers on the market. And at $170, the price is quite nice. The WISPR offers comparable quality to a lot of its competition, but at a lower price and with some interesting features. The one feature we wish it did have though is an adjustable temperature setting. For people who have never used portable vaporizers before, it won’t be something they will miss, but for the rest of us, we often like to have some control over what we are doing. 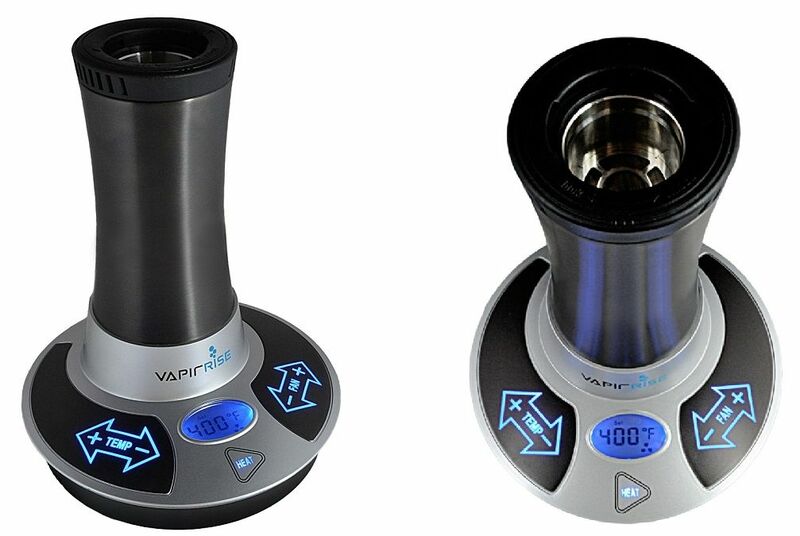 The Vapir Rise desktop vaporizer can vape herbs and waxes, features an LED touchpad and can reach a max temp of 420F. From a relatively new company, the Zeus Smite is a great performer, but how does it rate overall?